Back in the days when storytelling was the main form of entertainment, tales of mythical creatures abounded. Today we seem to indulge in the mere scraps of what was once an epic feast of legend. 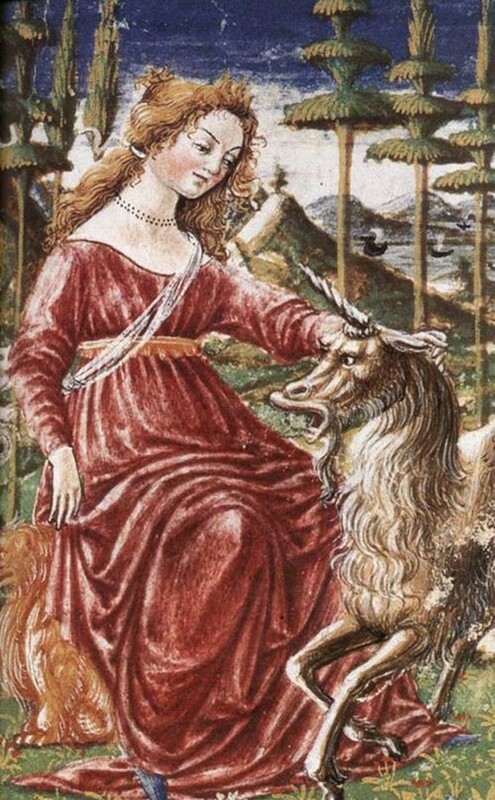 The legendary creatures still popular in contemporary stories and film only begins to scratch the surface of the enchanted world our ancestors knew in the past. If we dig deeper, we discover that our ancestors lived with magic, stories, and otherworldly beings as aspects of their every day lives. And today we take a little journey to meet some of the water spirits our ancestors knew well. The first critter we're going to meet is a helpful little guy. You've probably heard the story of The Shoemaker and the Elves, a German tale about kindly elves who help a cobbler at night while he sleeps, finishing the shoes he started the night before. Likewise, you have also heard about elvish little creatures from Scotland called Brownies, who are known to do house chores in exchange for porridge. Well, the Klabautermann is from this family of wee folk. Klabautermann are the wee fellows who assist aboard sea vessels. They were known to sailors in the North Sea and Baltic Sea. Klabautermann's clothing would be typical seafaring garb, a yellow rain jacket, woolen sailor's cap, and always with his tobacco pipe. Sailors could never see the Klabautermann, however. Yet, they knew his presence by the luck he brought aboard their vessel. 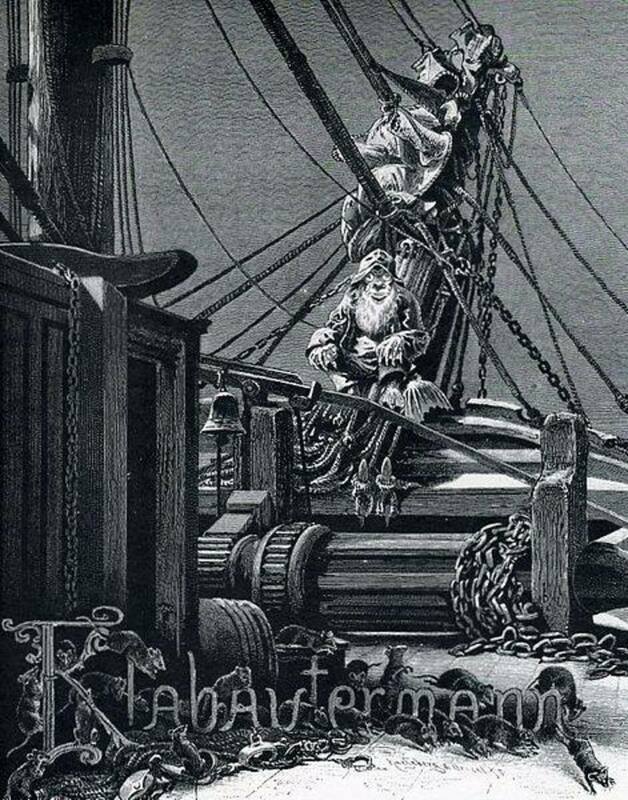 Often, the likeness of a Klabautermann was carved into the mast of the ship to invite the spirit on board with them. If sailors fell overboard, it was the Klabautermann who made sure they were spotted and rescued. Klabautermann remain invisible at all times... unless the ship is doomed. Then the sailors on board will be able to see him. This may be why Klaubautermann are sometimes blamed for bad luck on board ships. The shift from helpful spirit to malicious one, in most cases in European folklore, usually stems back to the conversion to Christianity. In many cases spirits that were considered positive and friendly were suddenly maligned and demonized. This may be the case here, because apparently older stories depict this spirit as a benevolent fellow, and more recent tales describe him as demonic, which probably hurt the poor little guy's feelings! Next time you bump into Klaubautermann, give him a hug and tell him he's welcome aboard your ship any time! The Dobhar-chú is more nefarious than the Klabautermann. There doesn't seem to be any legends claiming that Dobhar-chú is anything but ferocious. This creature is more of a cryptid than otherworldly being. 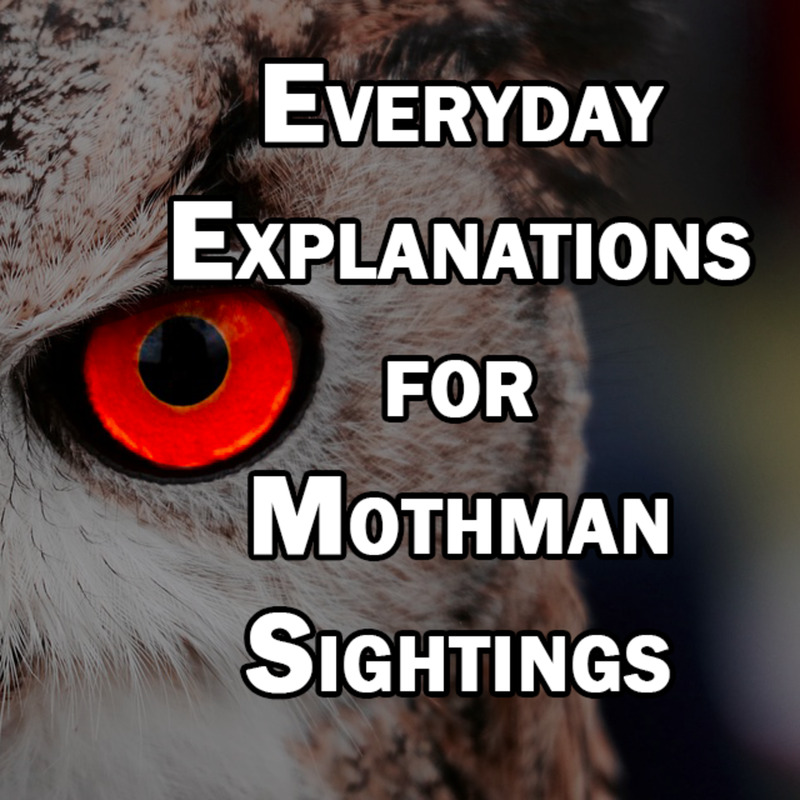 Cryptids are creatures which are thought to be real flesh and blood animals by witnesses who have seen them and researchers who hunt for them, but there is no hard evidence to prove their existence. They are also categorized as mythical because of the legends that grow up around them. Nessie falls into this category, for example. Dobhar-chú supposedly translates as water hound, from the old Irish. Descriptions of it vary widely. Most often it's described as a cross between an otter and a dog. Sometimes it's described as a large dog with flippers for feet. It has even been described as a large reptile-like creature on rare occasions. It is not known to be friendly, and there are old legends of people who were killed by Dobhar-chú attacks. So if you see one... RUN! 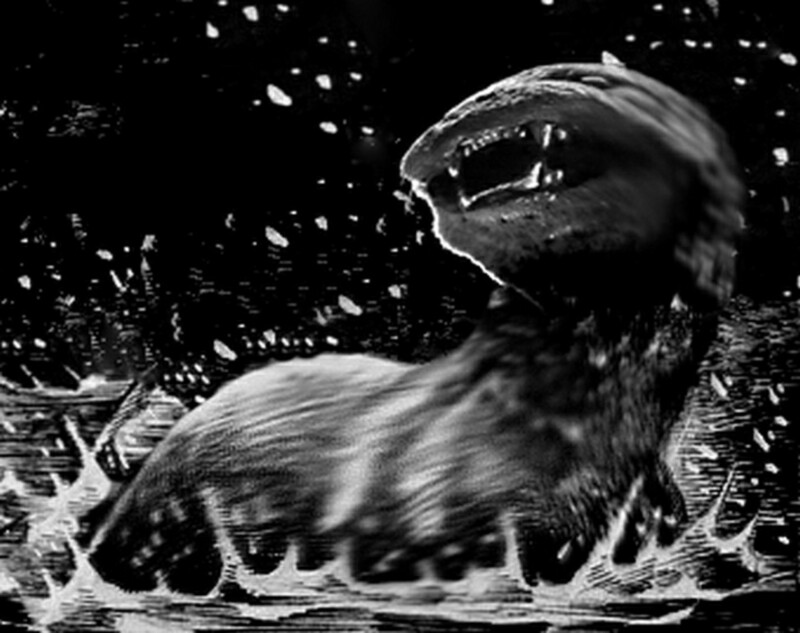 Trows are a type of mythological creature known only to the Orkney Islands, off the coast of Northeast Scotland. There are two types of trows; one that lives on dry land, and one that live in the sea. Land trows mainly inhabit mounds, and you may read more about them in another article here. At one time, the story goes, all trows lived together on dry land. But there was some kind of an argument which split the trows into two factions. The losing side were banished from land and forced to live from then on in the sea. 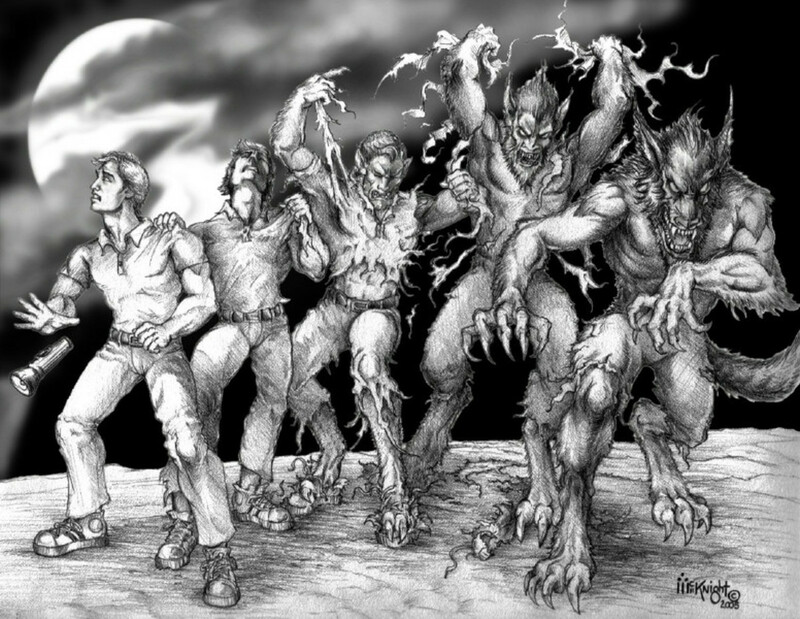 Although they were not described as wicked, they were horrible in other ways. Sea trows were notoriously ugly.They had large, frumpy faces and lumpy bodies that were always covered with dripping stinky seaweed. In fact, Orkney fisherman had a nickname for the sea trows. They called them "Tangy" from the local Orcadian word for seaweed - tang. Sea trows were also known to be incredibly stupid. They enjoyed coming onto dry land, but like other sea animals who are accustomed to swimming, their large, lumpy bodies were slow moving and cumbersome on shore. So they moved with a slow and lumbering gait. Once on land, the silly sea trows enjoyed playing tricks on humans. But, because they were not very intelligent, their tricks usually backfired! The poor, stinky, sea trow would end up scratching his head in bewilderment while the humans laughed at him. 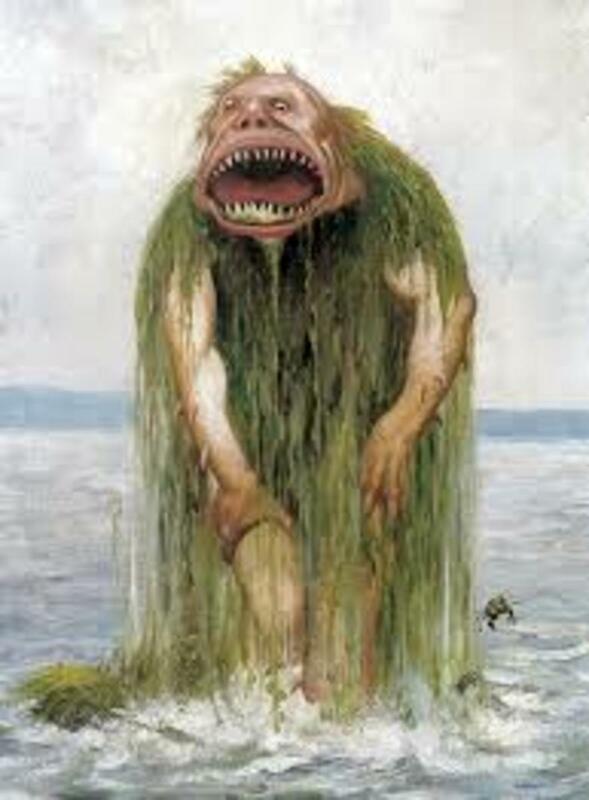 Vodyanoy is a male water spirit known to Slavic peoples of Central and Eastern Europe. 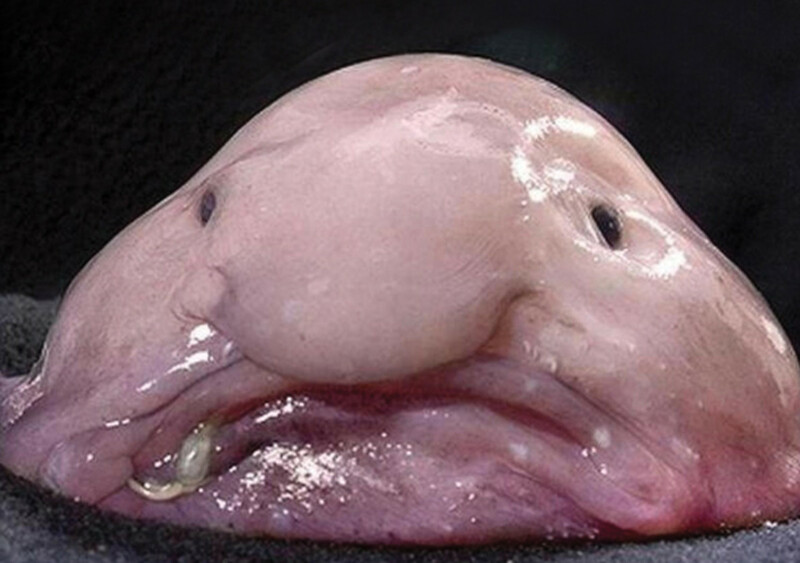 He is similar to a mer-man in that he is part man, part fish. 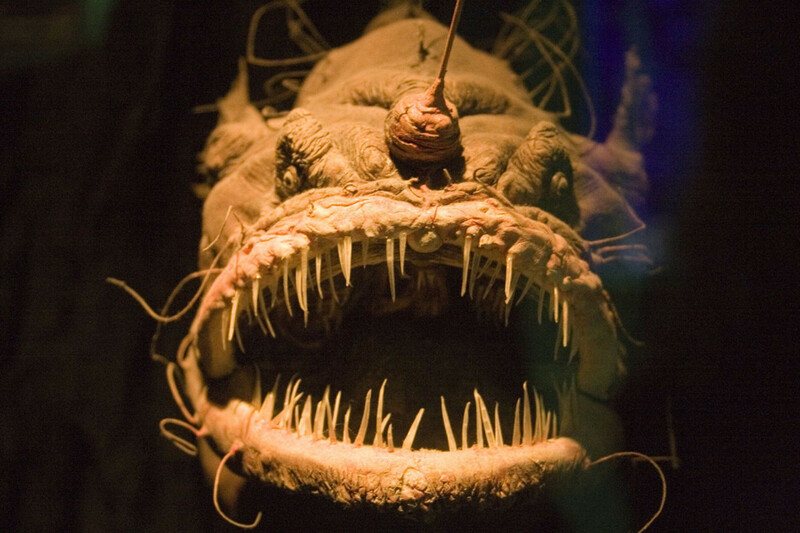 But, unlike typical Western notions of mer-people, the Vodyanoy is grotesque in appearance. Descriptions of him vary from region to region. Some say he is human-like, but covered with dark scales. Other legends describe Vodyanoy with the head of a frog. And, like a frog, his body is covered in muck from living submerged in the bottom of lakes and rivers. Emerging from the water, rather like the Creature From the Black Lagoon, the Vodyanoy's main pleasure was to destroy man-made structures that were in his waters (such as water mill wheels, dams, boats, etc). Vodyanoy also quite enjoyed capturing both humans and their animals and dragging them under the waves to their deaths. Vintage Russian depiction of a Vodyanoy. 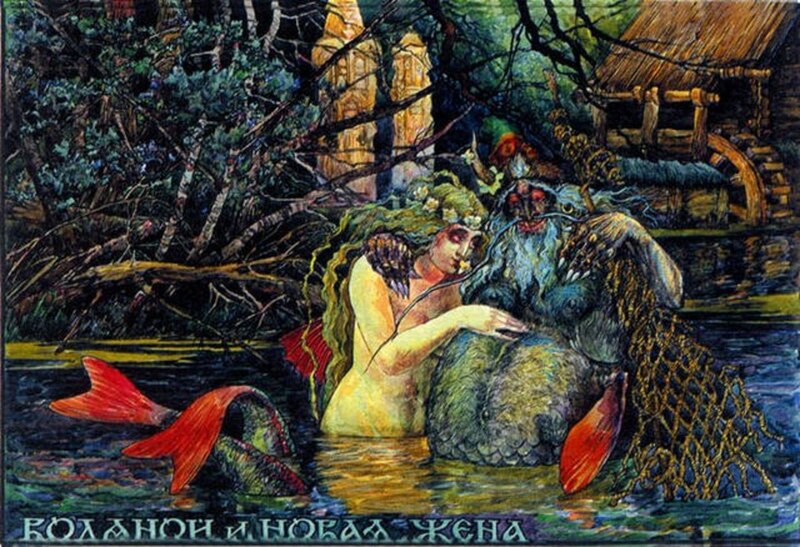 The Vodyanoy may have once been a river god whose status was reduced after Christianization. Many aspects of the Old Religion, in nearly all areas of Europe, lingered on in the local folktales and traditions. And very often old spirit entities lived on, though their roles were changed. 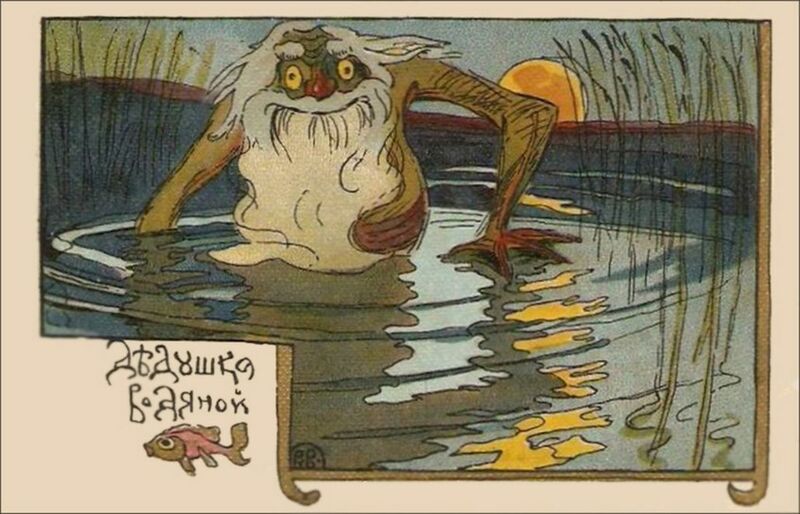 It's hard to say if the Vodyanoy was once some kind of a water deity, or if he was always almost troll-like in his repulsive appearance and wicked behavior. One aspect of his legend that hints at his pre-Christian role is that sailors and fisherman are known to have given offerings to Vodyanoy to appease him. This was supposed to ensure that he would not attack their vessel and take any of their men overboard and down to the bottom of the river to drown. Many spirits in old European mythology were neither good nor evil. They were often just like us humans. In other words some might be nice, others wicked, and often their actions depended on the circumstance. In Irish folklore, for example, there are many sayings about how to treat the Wee Folk. Making sure to treat them with respect ensures a positive experience. Treating them with disrespect will elicit the opposite. When the old ways of doing things became forbidden, the old beliefs probably became somewhat scrambled. Fragments survived out of context. Not to mention the demonization of all indigenous spiritual beliefs further corrupted their original meanings. So if you happen to meet Mr. Vodyanoy, give him the benefit of the doubt. He might be a really nice frog man! If you enjoyed this, please like my Writer's Page on Facebook. Another great article. I love the way that you organize your text. Your facts are interesting and spot on. Very interesting and highly terrifying if things like that existed. Great hub voted up. Very interesting. 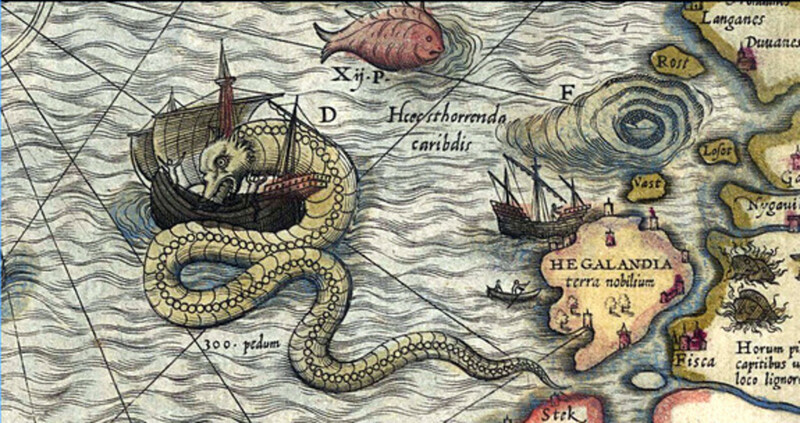 I never heard of these mythical sea creatures before, especially here in the United States. Thanks for sharing your knowledge of them. Voted up! Up voted and shared Carolyn- Another fab Hub...Glad I take the Channel Tunnel when going back to the UK! Very interesting read! I enjoy reading about the thoughts of the old sea farers. Thanks for sharing! Voted up. I particularly find a story of Vodyanoy very interesting. 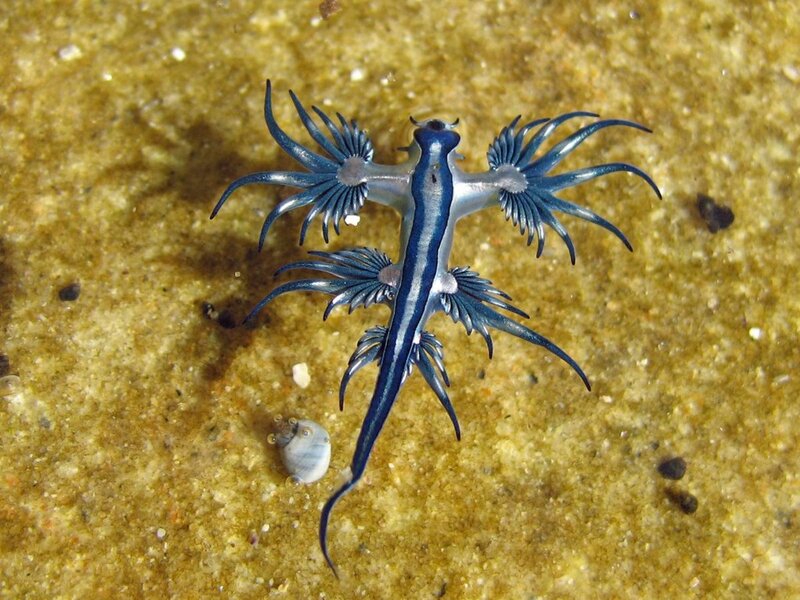 I am from the Czech Republic and, as you have mentioned, we have here in this part of Europe the same water creature. It is called Vodník (can be translated as a waterman), and he usually lives in the creeks, in the rivers, and mainly in the ponds. He is a neither good nor bad human-like, and he collects souls of people who drown themselves and keeps those souls in the cups with lids, so the souls cannot run away. He usually has green skin, long green hair and beard, and you can recognize him thanks to a dripping water from his one coat-tail. Vodník is a big part of our culture, he is one of the main characters in our fairytales, and there are a lot of folk songs about him. All of them warn people not to go close to him, as he is very unpredictable - can help you, or can draw you down under the water surface to his kingdom to have one more soul, or a servant. This hub is very interesting, Carolyn! I've never heard of any of the creatures that you describe. Thanks for creating such an informative and enjoyable hub. I loved this great read; voting up and sharing. :) -- I am tempted to order all the books you have displayed. These are awesome-- I love stories about mythological creatures & criptids, but I've never heard of any of these so this was a real treat! Well done! Such a terrific interaction to creepy legendary water critters I've never heard of! I enjoyed this! Voted up and more and sharing!